Involve children in simple meal preparations for family fun and to teach healthy eating habits. QUESTION: I’m a mom of twin preschoolers and want to make sure that I teach them healthy eating habits at an early age. How I can do that and stay within a modest food budget? 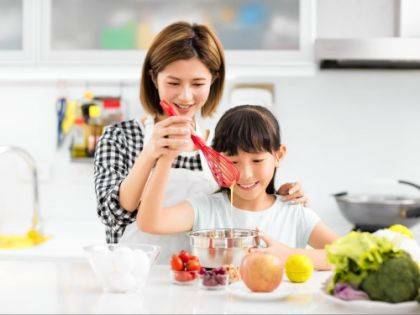 ANSWER: It’s wonderful that you want to establish healthy eating habits in your children starting when they are young. Research has shown that ensuring good nutritional habits, particularly early on, can help prevent childhood obesity and other chronic diseases.